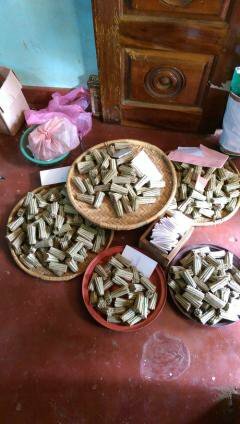 Women in one village in the Jaffna district of northern Sri Lanka have been rolling beedi with their bare hands for over fifty years in a gendered survival economy. This is no accident. Women beedi workers in Jaffna, Sri Lanka"Economic empowerment” and “restoring livelihoods” are tropes that are too often fetishised within Sri Lanka’s post-war development discourse, especially in relation to women living in former war-affected regions. Be it providing small grants, microfinance, or cattle and poultry to “rebuild livelihoods”, the state and development actors alike have been spearheading various development projects targeting women. While the extent to which these programmes empower women remains questionable, some women continue to be left out of post war development altogether. This is the case with the women of Vettikadu, a poor low caste village in former war affected Jaffna in Northern Sri Lanka. 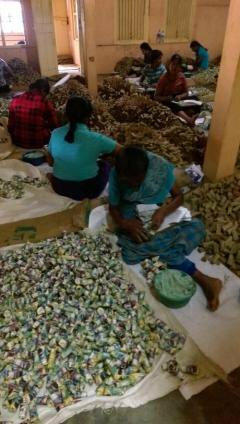 For over fifty years women in Vettikadu have been rolling beedi within the confines of their homes. Despite the fact that the bare hands of these workers undertake the core production functions associated with the beedi trade, they are only compensated one fifth of the final market value of each beedi stick that they roll. The remaining market value goes to the bigger players within the trade. This alienation of workers from the final product is maintained through informality that is imposed upon the workers. In other words, the company’s only connection with the workers is through middle men who manage the extraction of labour. In this way the company escapes its obligation to pay fair compensation, provide other welfare benefits such as insurance and pensions, while seriously undermining the workers’ health and wellbeing. Given the paltry wages that are paid, women are compelled to manage by borrowing - buying food on credit, mortgaging lands or pawning jewellery - or simply by cutting down on essentials like the number of meals or medical treatment. Meanwhile, the island-wide beedi industry has been growing exponentially, almost at 200%, since 2007, and is currently an industry worth 4 billion rupees a year. The entrapment of these workers in a violent trade is mediated through poverty. Anandhi Amma, an eighty year old woman from Vettikadu, has been rolling beedi since her childhood owing to dire poverty. In 1996 her son, a fisherman, who was the primary breadwinner of the family disappeared after being taken away by the military on suspicion of ferrying LTTE cadres. With her son gone, the sole burden of supporting her family fell on Anandhi Amma’s aged shoulders. Other women such as Sarojini and Geethanjali also started making beedi at a tender age following the death of family members. Sarojini was barely ten, when hunger within the family pushed her to start rolling beedi. Twenty seven years later, it is this everyday experience of poverty that keeps her entrapped in a trade that exploits her labour. Her “choice” of the way in which she expends her labour is therefore determined by poverty, and the obligation to provide for her husband who is injured and unable to work, and their five school going children. This is an added burden to her household obligation to cook, clean, and care. Often, she is subject to beatings by her husband for failing to ‘fulfill’ these ‘duties’. For years these workers have been rolling beedi with no breaks during the day, at inconceivable speed under precarious, exploitative and injurious conditions, and inhaling the thick air filled with tobacco dust and fumes through their lungs and their skin. The physical and emotional toll on women’s bodies is immense. Many work until their death. And this exploitation continues all the way to India where tendu leaves - which are used to roll beedi - are plucked by poor Adivasi women, whose labour is exploited within a transnational trade. The violent nature of alternative forms of work available to these women who have missed school due to war and poverty, exacerbates their dependency on the beedi trade, which requires limited skills and no capital outlay. The village’s predominant form of livelihood is fishing, and is a masculine domain, controlled by powerful upper class boat owning men. It is an economic space which is difficult for women to access and navigate without being subject to sexual harassment and unfair competition. There are not that many alternative jobs outside the village for these women. The limited jobs that are available in textile shops for example are also mired in violence. Some women workers our reseacrh team met in Jaffna town cited the exploitation and harassments within these workplaces. The terms and conditions of employment are severe: no proper breaks or facilities, including toilets, absence of contracts, leave and statutory welfare benefits, and low wages that are often not paid in full or on time. The women workers also said that they are generally paid much lower than their male counterparts. We were told that caste is an unwritten element of hiring practices; some textile shops hire poorer women from lower castes because it provides the employers with greater room for exploitation, and sexual harassments that they are subjected to within the workspace, as well as while travelling outside for work. It is within this context of “outside” and “inside” the village being unsafe that a large cardre of women is engaged in rolling beedi within their houses. While rolling beedi is a form of survival for the women, it is part of an accumulation economy for the big players within the trade. It is on the backs of these poor rural women living in a gendered survival economy that the beedi trade is accumulating capital. It is a trade within which women’s bare labouring bodies are exploited in a necroeconomic space, where the labouring body is exposed to violence until death. It is precisely through the entrapment of workers by their continuous alienation from the end product value that the workers must continue to work in such necroeconomic spaces to pay for daily necessities. Women’s entrapment within necroeconomic spaces is by no means an accident. It is under the auspices of the necropolitics of the state that the spaces of violent accumulation such as the beedi trade have thrived for over fifty years. A necropolitical state order that fails to provide secure work and social protection to alleviate poverty and rebuild lives after a war, reduces these women - to borrow from Agamben - to a ‘bare life’, lives that are unprotected, and exposed to all forms of violence. Even though the war has ended, in Vettikadu, the continuation and expansion of necroeconomic spaces such as the beedi trade is indicative of how conditions of war and conflict exist even within a ‘post-war’ political economy. The necropolitics of the centre that produce, regulate and exploit these women within necroeconomic spaces can collectively be identified as a necrocapitalist project - the legalised process through which women’s labouring bodies are exposed to violence until their death. This is not a failure of development in post-war Sri Lanka; this is the face of development. The names of individuals and the village in this article have been changed to protect identities. All images by Nadhiya Najab.